Across the energy sector, women make up less than 30% of the workforce, but that is changing as more young women enter the sector and as the industry makes a concentrated effort to increase gender diversity. What's it like to be a woman working in energy? What can both male and female executives do to encourage more diversity in the sector? And what skills make any young professional well prepared for a career in energy? 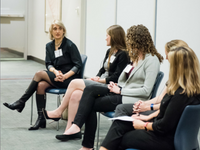 In coordination with Duke Women's Weekend, the Duke University Energy Initiative and the Center for Energy, Development, and the Global Environment (EDGE) at Duke's Fuqua School of Business invited four alumnae to share their thoughts on these questions with energy students at Duke. Ask Leah Louis-Prescott (MEM'18) why she's in graduate school and you'll get a straightforward answer: "I want my career to make a direct impact on climate change." 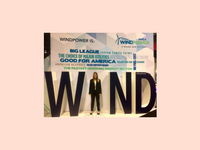 This summer, a Rudd Mayer Fellowship from the national Women in Renewable Industries and Sustainable Energy (WRISE) organization helped Louis-Prescott explore the possibilities by attending WindPower, the annual conference of the American Wind Industry Association. 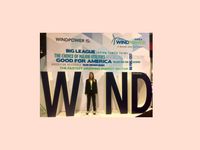 During the four-day event last month, Louis-Prescott visited industry booths and attended talks on everything from energy prices at high wind levels to regulation promoting the zero-carbon attributes of wind. Louis-Prescott, second row, center, at Windpower along with other Rudd Mayer Fellows. “Being able to interact with these professionals, talk with them about how they got where they are, seek advice, and network is so helpful as I consider what to do when I graduate,” Louis-Prescott said. She is grateful that the Rudd Mayer Fellowship also includes access to the nationwide WRISE network of female professionals in renewable energy. While Louis-Prescott is increasingly intrigued by renewable project development (and the wind industry in particular), she continues to explore a range of options, maximizing opportunities across Duke University. Last fall, for example, Louis-Prescott was co-organizer of the Nicholas School Energy Club's Denver Career Trek, which enabled graduate students from the Nicholas School, Fuqua School of Business, and Pratt School of Engineering to spend fall break visiting Denver-area energy companies and organizations. Louis-Prescott (lower left) with members of her Bass Connections in Energy team and faculty lead Lori Bennear (lower right), Grainger Associate Professor of Energy Economics and Policy and the Energy Initiative's associate director of educational programs. This summer, Duke’s Stanback Internship program is supporting Louis-Prescott as an intern at the Rocky Mountain Institute in Boulder, Colorado, which she first visited as part of the Denver Career Trek. She is working on an RMI study of when, where, and how residential customers can save money and reduce carbon emissions by switching from fossil fuel-powered household devices to electric devices. In the fall, she is looking forward to energy coursework offered by the Fuqua School of Business and Duke Law School—along with participating in a Bass Connections in Energy project addressing the regulation of autonomous vehicles. 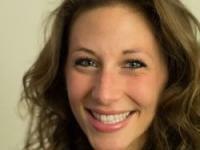 Louis-Prescott will also serve as co-president of the Nicholas School Energy Club. Are you a Duke student interested in energy? Sign up for our email list to stay on top of events and opportunities. Are you an alum or energy professional who seeks to connect with Duke students? Want to learn more about how you can support opportunities for Duke students to learn outside the classroom? During Fall Break, the Nicholas School Energy Club sent fifteen graduate students from the Nicholas School of the Environment, Pratt School of Engineering and Fuqua School of Business to Denver, Colorado, as part of the club’s annual Career Trek. 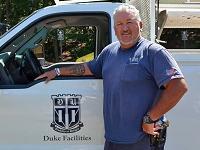 The Duke University Energy Initiative contributed financial support for the trip. Leah Louis-Prescott and Eleanor Johnstone, students in the Master of Environmental Management program, coordinated the visits. The students learned about new trends and developments—and employment opportunities—in a wide range of energy sectors, including clean energy research and technology, electric utilities, energy consulting and the oil and gas industries. Are you interested in financially supporting career development opportunities for Duke students interested in energy?